Here at the AbballeMoresiGroup we don’t just sell real estate, we sell a lifestyle. After many years of individual service, Danny & Andrew have decided to bring together their unique qualifications to develop the AbballeMoresiGroup. Danny brings 20 years of leadership experience as a Regional Sale Manager and Marketing Specialist with a Financial Planning background. After a substantial and successful career in the corporate world, Danny decided to pursue his passion in Real Estate. Andrew brings 40+ years of family real estate experience having being groomed as a realtor since birth. Having previously worked as a financial advisor for TD Bank and learning the in’s and out’s of the banking world, Andrew decided to bring his knowledge of finance to the world of real estate. 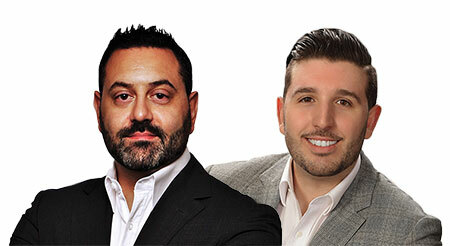 Combined the AbballeMoresiGroup have achieved over $100 million in gross sales and have consistently put their clients needs ahead of their own. At times, their clients have called the AbballeMoresiGroup an extension of their family. Their service and marketing plan is said to be unmatched. Their main goal is to consistently exceed client expectations. At the AbballeMoresiGroup, our passion will drive your dreams.